I have sold a property at 309 1068 BROADWAY W in Vancouver. I have sold a property at 3449 20TH AVE W in Vancouver. This is a three level Dunbar family home on a quiet tree-lined street with winter views of the water, mountains and city. It has been completely, tastefully renovated with four bedrooms on the top floor, an open plan main. Mature landscaping with a fully fenced yard and a two car garage with single door plus a parking pad. Hardwood floors on the main in a generous living and dining room with gas fireplace. Chef's kitchen with island, eating area, granite countertops, SUB-ZERO fridge, VIKING dual fuel range, BOSCH dishwasher and tile backsplash. Family great room with gas fireplace and lots of built-ins make this comfortable and cozy to get together with friends and family. Upstairs has a master suite with 2 sinks and large shower. Downstairs is a fully finished basement perfect for a nanny or a teenager. Beautifully maintained, a pleasure to show and move in ready. In the Kitchener Elementary and Byng High School catchments and close to the Dunbar high street for shopping and restaurants. YOU'LL LOVE IT! I have sold a property at PH3 1102 HORNBY ST in Vancouver. The Penthouse: Enchanting 3 bdrm + den & office with 30' high glass jewel case windows in "Artemisia," a 21 home boutique residence proudly presented by Boffo Developments. Destined to be one of Vancouver's most sought after developments,Artemisia offers a new parallel of luxury urban homes. Defined by rich custom cabinetry, expansive granite counters, the gourmet kitchen features a premium line of Gaggenau appliances. Distinctive spa-like bathrooms with specialty vanishing TV mirror. Generous outdoor living. Very high acoustic ratings, geothermal heating/cooling, biometric security. Measurements are approximate, from strata plan & should be verified by the buyer. Serious inquires only by appointment. Please visit our Open House at 3449 20TH AVE W in Vancouver. VANCOUVER, B.C. – August 5, 2015 – Metro Vancouver home sales were more than a third above the 10-year average in July, while the number of homes listed for sale continues to trend below recent years. The Real Estate Board of Greater Vancouver (REBGV) reports that residential property sales in Metro Vancouver* reached 3,978 on the Multiple Listing Service® (MLS®) in July 2015. This represents a 30 percent increase compared to the 3,061 sales recorded in July 2014, and a decrease of 9.1 percent compared to the 4,375 sales in June 2015. Last month’s sales were 33.5 percent above the 10-year sales average for the month. New listings for detached, attached and apartment properties in Metro Vancouver totalled 5,112 in July. This represents a 3.8 percent increase compared to the 4,925 new listings reported in July 2014. The total number of properties currently listed for sale on the region’s MLS® is 11,505, a 26.3 percent decline compared to July 2014 and a 5.5 percent decline compared to June 2015. The MLS® Home Price Index composite benchmark price for all residential properties in Metro Vancouver is currently $700,500. This represents an 11.2 percent increase compared to July 2014. With the sales-to-active-listings ratio at 34.6 percent, the region remains in seller’s market territory. Sales of detached properties in July 2015 reached 1,559, an increase of 17.9 percent from the 1,322 detached sales recorded in July 2014, and a 24.8 percent increase from the 1,249 units sold in July 2013. 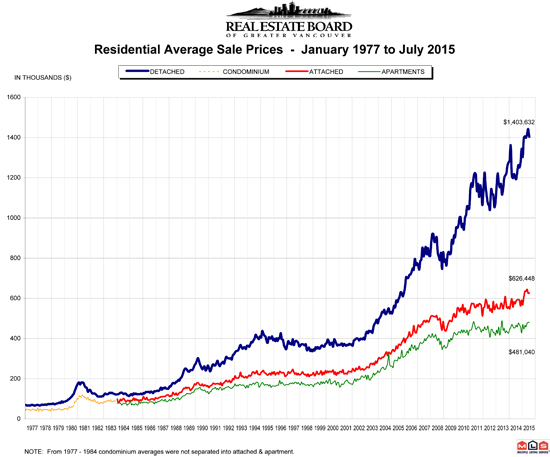 The benchmark price for a detached property in Metro Vancouver increased 16.2 percent from July 2014 to $1,141,800. Sales of apartment properties reached 1,729 in July 2015, an increase of 42.7 percent compared to the 1,212 sales in July 2014, and an increase of 42.9 percent compared to the 1,210 sales in July 2013. The benchmark price of an apartment property increased 5.9 percent from July 2014 to $400,900. Attached property sales in July 2015 totalled 690, an increase of 30.9 percent compared to the 527 sales in July 2014, and a 41.7 percent increase from the 487 attached properties sold in July 2013. The benchmark price of an attached unit increased 7.8 per cent between July 2014 and 2015 to $511,500. I have listed a new property at 3449 20TH AVE W in Vancouver. I have sold a property at 4766 KNIGHT ST in Vancouver. Knight Street Property This is an 8 bedroom, 3 kitchen, 4 bathroom house. RT-2 zoned 33x131.95 lot. The main floor is a four bedroom two bath with master ensuite. It has living room dining room and kitchen with eatingarea. There is a gas fireplace, tile floors and a large sundeck. Downstairs are 2, two bedroom and one bath suites. There are two separate spots in the attached garage and lots of parking off the lane. This is an ideal house for a large family, investors or starting out with mortgage helpers. Centrally located to shopping on Kingsway and Knight, Parks, recreation and transportation in the heart of Vancouver. YOU'LL LOVE IT!